Discussion in 'Baja Bytes By Gary Graham' started by Baja Bytes, Dec 17, 2018. Reports of rain from Loreto on down to East Cape remind us that we do have a winter in Baja. 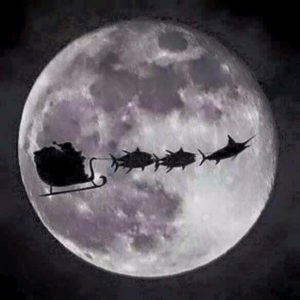 Not many anglers have arrived as Christmas looms ahead of us. They are probably doing a little last-minute shopping. 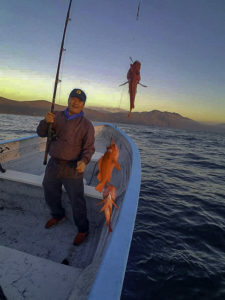 For the few who are fishing, it’s bottom fishing on the west coast of Baja with an occasional yellowtail mixed in. 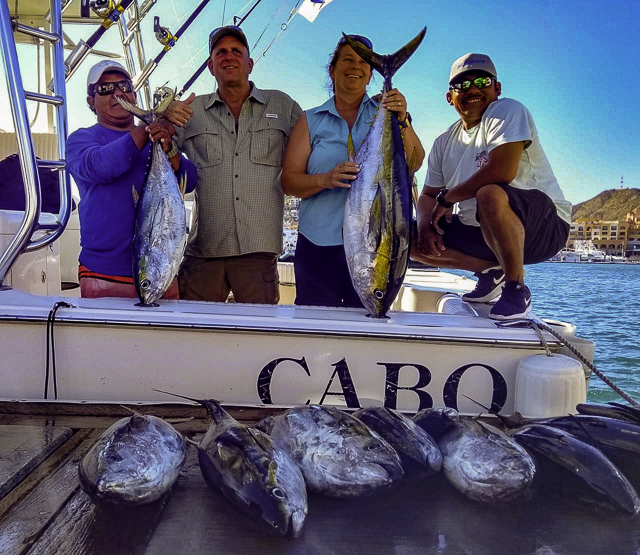 Above Cabo San Lucas, on the “Finger Bank,” the reports continue to dazzle those willing to make the long run uphill … still double-digit releases. Closer to the tip there are a few billfish, plus at least one monster tuna at the Gordo Bankand a few roosterfish lurking near shore. 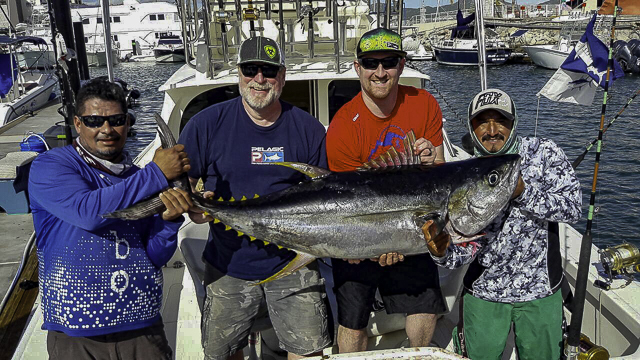 East Cape, La Paz and Loreto are still enjoying decent fishing in between the north wind blows. Tracy Ehrenberg, Pisces Sportfishing described the ongoing, illegal striped marlin harpooning by pangas in Cabo San Lucas Finger Bank area, highlighting Pisces Sportfishing’s response and continuing efforts to prevent the illegal activity in the future. On the 21st of November of this year (2018), an operation was carried out with logistics set in place by SEMAR, FONMAR, CONAPESCA and PISCES GROUP CABO, where a navy interceptor boat and a Pisces Sportfishing boat participated with observers from FONMAR on board as well as representatives of Sportfishing. 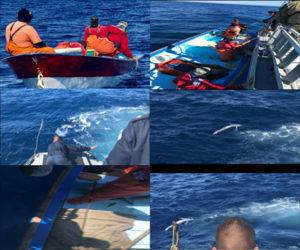 The result of the operation was the impounding of a 22-foot panga with S.C.P.P Punta Lobos on the hull with the name Punta Lobos XLII and with registration number 0304182513-5 and a 115 hp Suzuki outboard motor 4 stroke, two harpoons and three trunks of fish without heads or tails which were fresh marlin giving a total weight of 95.78-pounds. It should be mentioned that more evidence could not be obtained at time of the inspection. This action took place when the crew of the above-mentioned boat, where found chumming with bait known as mackerel, to bring the marlin to the surface, where harpoons were then used to spear the fish. 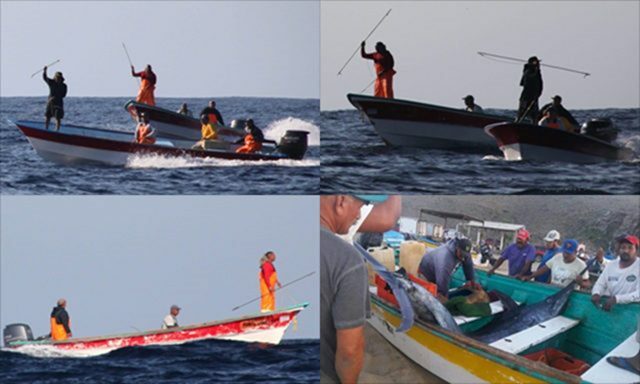 When the fishermen became aware of the patrol boats presence advancing towards them, they threw the product, consisting of pieces or marlins into the sea, actions confirmed by the observers of Fonmar and the representatives of Sportfishing. The patrol boat proceeded to do an inspection of the fishing boat, finding 30 pieces of mackerel bait, as well as two hand held harpoons, wrapped in a canvas sheet and blood on the floor of the boat which the fishermen were attempting to clean at the time of the inspection. 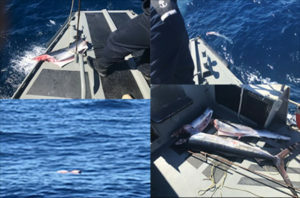 Immediately a search was made of the nearby area where marlin trunks were found floating, which were secured, and the formal report was written up along with the impounding of the fishing boat, motor, product and harpoons which possession and use of is prohibited by law. Main catch is rockfish with the odd bonito or two and some mostly-short bass. Lures? What brands do you recommend? Do you prefer sinking or floating? I have enough plastics and iron.! don’t anticipate we will do that much trolling. There haven’t been any changes in the fish count this past week and delicious bonito are still topping the list. Second place was a tie — a back and forth battle between cabrilla and dorado on most days. Roosterfish and sierra are consistent along the coastline from the airport all the way to San Bruno. The commercial handline fishermen are catching yellowtail while fishing for snapper on the rock piles. Few of our clients are interested in “sitting and soaking” for the needed hours in Yellowtailsville! although sardina are great if you can chum up a boil of fish. The “go to” spot for cabrilla is still the rocks north of “el bajo” with a few fish close to 20 pounds. Can’t say enough about shooting striped marlin on bait balls in Mag Bay last month. Glad Hunter got some photos of me (Pat Ford) — with Hunter Ledbetter and Eli Martinez. Dom Castagnola – Saw frigates working and jumping dorado just inside that Barco Azul on the left one day. Tis the season and the north winds and cooler temperatures are here. For the early risers, there is always a chance for a few “quickie” dorado, yellowfin tuna or maybe even a wahoo. Inshore it may be a sierra or perhaps a few bottom fish off the pinnacles in front of the jetty at Costa Palmas Marina. Either/or but don’t linger out too long or it may be a bumpy ride back to shore as the winds pick up mid-morning. Most of the operations are kicking back, getting into the holiday spirit and only going out if asked. Still no signs of a new resource for sardina; caballito continue to be netted in the marina channel. Other bait options for anglers have included strips of squid and ballyhoo. 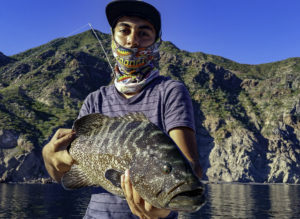 Local sportfishing fleets are searching out the fishing grounds from Chileno to Vinorama with the most consistent action being found from Iman to Vinorama. The problem is that this is where the wind has been blowing the grounds out of shape and making it more difficult to drift fish for the yellowfin tuna. 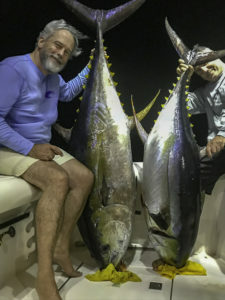 Anglers were doing well to land two or three yellowfin tuna, ranging in sizes from 10- to 80-pounds — most being in the 10- to 20-pound class. 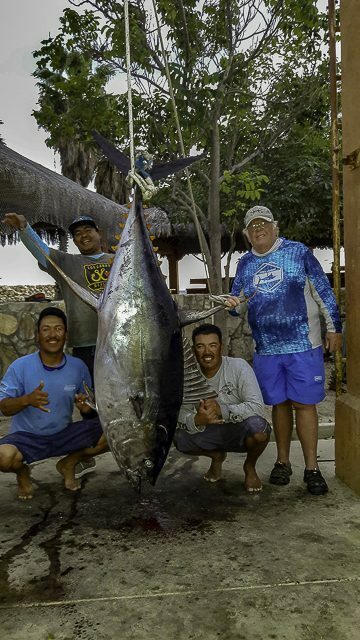 The highlight catch was the super-cow-sized tuna brought in by a team of local anglers. This yellowfin tuna weighed in at 313-pounds and was hooked into on the Gordo Banks on a piece of squid — quite an impressive tuna for this late in the season! It took the team close to an hour and a half to bring the monster to gaff. Besides the sporadic bite for tuna, the dorado and wahoo proved to be even more elusive. Only a scattering of these gamefish were caught. Hard to say what the coming weeks will bring – perhaps cooler, off-colored greenish ocean conditions. It’s seasonal transition time. Should start to see schools of mackerel and sardineta move in; this migration usually brings in more fish. 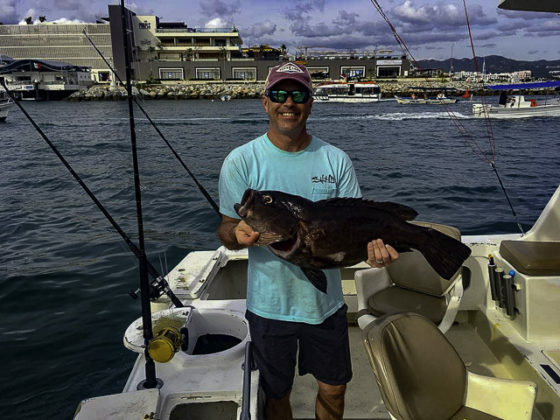 Not normally the known season for these fish, the off-the-shoreline-charters were doing well for roosterfish, particularly in front of the San Jose del Cabo hotel zone. Most of these roosterfish are smaller-sized juveniles, under ten pounds, with an occasional larger specimen in the mix. Please remember: always release these prized fighting gamefish! They are known more for trophy fish — not known for their eating quality. Take a photo and release! Not much bottom action because of the swift currents and dominance of triggerfish. We did have one nice California sheepshead, as well as island jack, some pargo and a couple of amberjack and bonito. 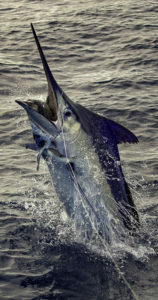 Billfish is mainly going on in the Pacific now, with very little marlin action off San Jose del Cabo. When their food source moves in this direction, the marlin will follow. Numbers at a glance: Billfish 68%, tuna 32%, dorado 21%, other species 10%. The amazing Finger Bank action continues! Marlin that were being found closer to Cabo between the Old Lighthouse and the Margarita’s area are a bit scarcer, showing up in good numbers at the Golden Gate Bank instead. Up to seven marlin were caught by Pisces 35-foot Valerie, with an average of two to three per boat. Tuna numbers have risen slightly, although captains are still going quite a distance to find them. Dorado, wahoo and smaller game fish (including grouper) are around but only a few roosterfish. Out of 63 boats, 61 were catching fish! Over 270 marlin were caught and released, and 193 tuna caught, with releases as well when anglers reached limits. Our top release boat at the Finger Bank was the Pisces 72-foot Tag Team, who has yet to get in on the Finger Bank frenzy but settled right in releasing 46 striped marlin weighing about 100-pounds each on ballyhoo. They also released the only blue marlin, also about 100 pounds. On another run to the Finger Bank, 35 striped marlin were released, this time on mackerel and ballyhoo. Baby Brother, a 37-foot Tag Team III, also headed to the Finger releasing 13 striped marlin one day, 4 on another day, though slightly closer to home between San Jaime and Golden Gate area. 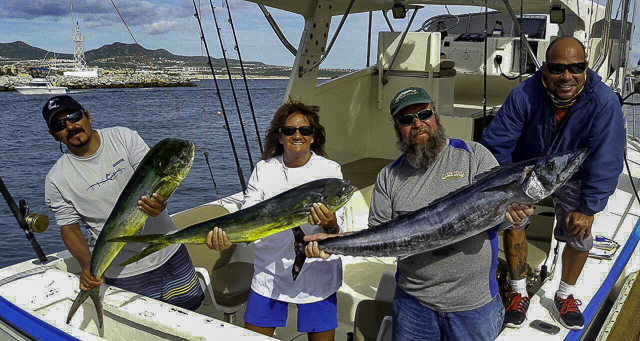 The marlin hit on mackerel and a black/green lure. 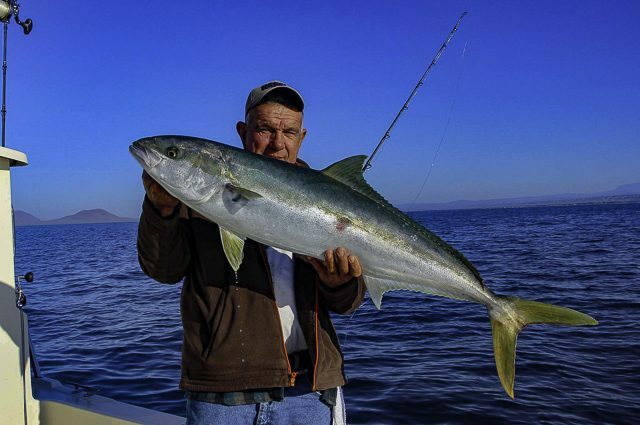 Inshore fishing has continued to produce nice catches of smaller dorado and schools of skipjack with sierra showing in increasing numbers from Solmar to El Arco. Roosterfish are showing in the surf from Solmar to around the point at the Lighthouse as well as in the Palmilla area. Cabo Climate: Warm, partly cloudy. Some light wind on a few days, but overall good conditions. Sea Conditions: Seas have been relatively calm in the mornings throughout the area with some swells and chop showing up in the afternoons. Forecast is for more of the same with winds in the 6- to 9-mph range from the WSW and shifting to the WNW by the end of the month. Sea temps were closer to 79 to 81°F, cooling to 73 to 75°F after a couple of weeks. Best Fishing Areas: Finger Bank, Golden Gate Bank, San Jaime, Migrino, and the 210 Spot. Favorite Bait: Trolled smoke trail lures along with live caballito or mackerel were the favorite for the marlin. Soaking live bait around the Finger Bank produced successful multiple striper counts. Everything seemed to work for the dorado from trolled lures to drifted bait. Hoochies were by far the preferred and most productive lures for the sierra. 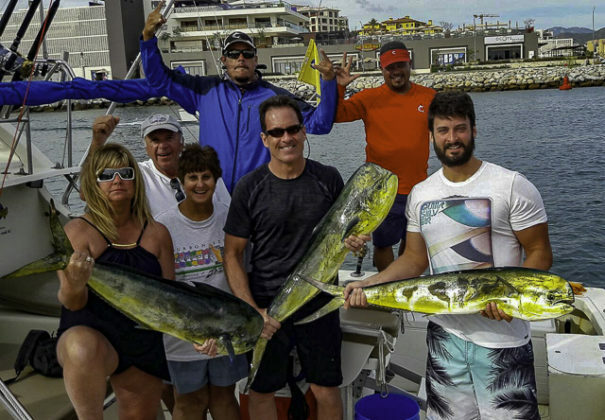 December 1st – 12th — the Rum Line (40-foot Gamefisherman) with Capt. 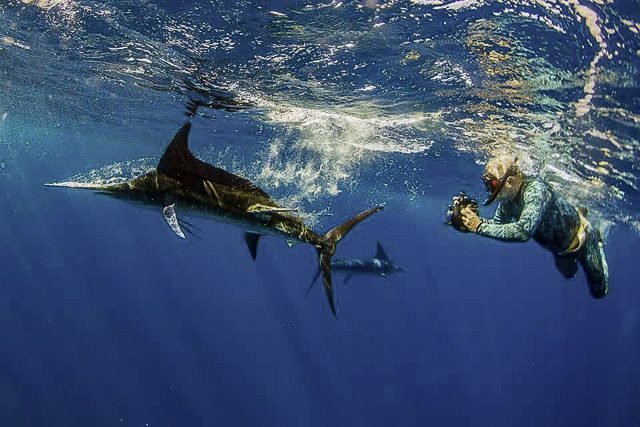 Chris Sheeder, had 123 raises, 97 bites, and 63 sailfish releases, plus they had 7 marlin raises, 7 marlin bites, 1 marlin release, 7 tuna, and 9 mahi-mahi. December 3rd – 6th, & 7th — the Poco Loco (44-foot Kincheloe Nickerson) with Capt. David Salazar/Capt. 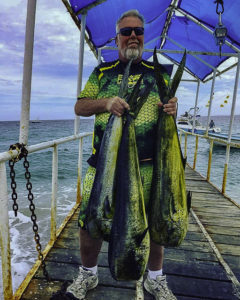 Terry Brennan, had 57 raises, 51 bites, and 39 sailfish releases, plus 1 marlin raise, 1 marlin bite, 1 marlin release, 3 tuna, and 3 mahi-mahi. mulegemike and Tunahead like this.